A team of researchers from the University of Hawai’i at Mãnoa, University of Washington and Scripps Institution of Oceanography (SIO) analyzed the motion of Earth’s crust from the data collected by an array of GPS instruments placed near the San Andreas Fault System in Southern California. Their results revealed almost 201 km (125 miles) wide lobes of uplift and subsidence straddling the fault system. The motion has not been recorded so far, although it was predicted by theoretical models. The GPS instruments record a vertical and horizontal motion of our planet’s surface. The tectonic motion of the crust, groundwater pumping, local surface geology, and precipitation amount all affect the vertical motion, and it was challenging to distinguish the broad, regional tectonic motion from the local motion. The scientists have used comprehensive statistical methods to analyze the data recorded by the EarthScope Plate Boundary Observatory’s GPS network, and extract a large-scale pattern of smoothly varying vertical motions of the local crust. “While the San Andreas GPS data has been publicly available for more than a decade, the vertical component of the measurements had largely been ignored in tectonic investigations because of difficulties in interpreting the noisy data. Using this technique, we were able to break down the noisy signals to isolate a simple vertical motion pattern that curiously straddled the San Andreas fault,” said Samuel Howell, a doctoral candidate at the UH Mānoa School of Ocean and Earth Science and Technology (SOEST) and lead author of the study. 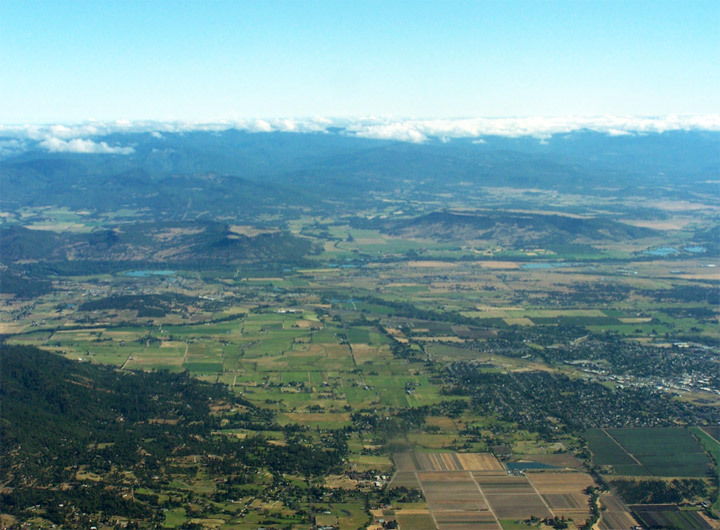 The results responded to those previously predicted by an earthquake cycle model, led by co-authors Bridget Smith-Konter, associate professor at SOEST, and David Sandwell, a professor at SIO. “We were surprised and thrilled when this statistical method produced a coherent velocity field similar to the one predicted by our physical earthquake cycle models. The powerful combination of a priori model predictions and a unique analysis of vertical GPS data led us to confirm that the buildup of century-long earthquake cycle forces within the crust are a dominant source of the observed vertical motion signal,” said Smith-Konter. New research suggests the scientists can use GPS vertical motion measurements to improve the understanding of the structure and behavior of faults, even when no major ruptures occurred for decades or, even, centuries. Results are expected to contribute to constraining the seismic hazard estimates from the San Andreas Fault System, and could enable mapping of the large-scale motion resulting from the next significant rupture of the fault, in more detail. The chances of a damaging earthquake occurring in parts of Oklahoma and some neighboring states are just as likely as they are in temblor-heavy California, according to a report by the U.S. Geological Survey (USGS). The culprit? Man-made activities related to oil and gas production are creating the shaky conditions in a region of the central and eastern U.S., the USGS seismologists say. USGS scientists just released their first map that includes earthquake risks from both natural and human-induced causes for the coming year. Until now, the government agency included only temblor risks linked to natural causes. Still, wastewater injection practices have put six states on the earthquake map. Oklahoma has the highest risk, followed by Kansas, Texas, Colorado, New Mexico and Arkansas, the USGS reported. Oklahoma and Texas have the largest populations living near induced-earthquake hotspots. And through mid-March of this year, 226 earthquakes of a magnitude 3.0 or higher have already hit the central United States, the USGS said. The largest earthquake to occur near a wastewater injection site was a magnitude-5.6 temblor near Prague, Oklahoma, in 2011. Overall, USGS researchers found 21 areas with increased rates of human-induced seismicity. Some areas — such as regions within Alabama and Ohio — experienced human-induced earthquakes in the past, but have relatively little risk in the coming year because the activities that caused these quakes have decreased. But other areas of Alabama and some parts of Mississippi have shown an increase in these activities. But researchers are still determining whether earthquakes in these areas happened naturally or were human-induced, the USGS said. The scientists found the greatest risk of a human-induced earthquake in north central Oklahoma and the southernmost part of Kansas. They calculated that there is a 10 to 12 percent risk that an earthquake with strong shaking will occur in those areas this year. Such an earthquake, they estimated, would register a 6 or greater on the Modified Mercalli Intensity scale, meaning it would easily be felt but would likely cause just slight damage. This translates into about a 5.0 on the Richter scale. Though scientists disagree about whether wastewater injection leads to larger or smaller earthquakes compared with natural ones, in the CEUS region, when a large temblor does strike, thousands of faults could rupture, according to the USGS. What’s more, human-induced quakes tend to come in swarms of smaller events at shallower depths, whereas shaking is more likely to be felt and cause damage. The new earthquake report will help architects determine how to safely design buildings within areas of high risk. People who live in earthquake territory can read about safety measures at FEMA’s Ready Campaign. A rare M3.1 earthquake has struck the volcanoes next to the famous “AREA 51” base in Southern Nevada. Above: Past 12 hours of earthquakes (up to 930am CT December 11 2015) , showing M2.7 and greater in the United States. The epicenters of the events show the only locations to experience any noteworthy movement are three dormant volcanic fields. Do not confuse this with a “UFO crash” (lol!) or a bombing range test — the depth of the earthquake was at over 8km / 5 miles below the surface. This movement at the ancient volcanic complex next to Area 51 is part of a much larger seismic event underway (currently) on the West coast of the United States. Above: Google Earth search of the USGS earthquake coordinates shows the M3.1 earthquake striking between the long dormant AREA 51 volcanic fields at a depth of over 5 miles. In addition to the long dormant (extinct) volcanoes next to Area 51 showing activity, we see that the ONLY other locations to have M3.0+ activity are other volcanic locations to the North and South. The swarm of earthquakes to the North struck Challis Idaho, which is the Westernmost portion of the Yellowstone Magma chamber, and a location where a man was almost killed in geothermal activity a few months ago. 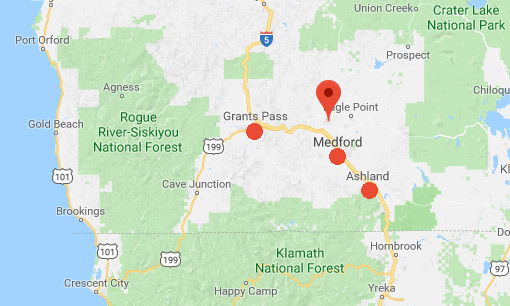 Challis, ID is also the location where the USGS went to install new monitoring equipment after a M5.0+ earthquake struck the location 2 years ago. To the South of the Area 51 earthquake location , Cerro Prieto volcano showed up with an earthquake swarm as well, topping out at M3.1 in power. This dormant volcano was forecast to show movement in the most recent earthquake forecast video issued on December 8, 2015. Overall, this seismic unrest at the dormant volcanoes along the West coast was expected. The locations which are showing movement were all named out in the above forecast video, literally called out each location by name , Central Idaho (Challis), California border (Cerro Prieto), and Western Nevada near the California border. SAN RAMON, Calif. (AP) — A swarm of small earthquakes has been rattling an area east of San Francisco, with more than 200 recorded since last week. All the quakes were centered around the city of San Ramon on either the Calaveras Fault or offshoots of it. The largest struck Monday and was logged as a magnitude-3.5, according to the U.S. Geological Survey. No injuries or major damage have been reported. IS A SWARM LIKE THIS A PRECURSOR TO A BIGGER EARTHQUAKE? The San Ramon, Danville and Alamo area has seen several swarms over the past 40 years, U.S. Geological Survey Research Geophysicist Brad Aagaard said. The largest earthquake in each was in the magnitude 3.5 to 4.4 range. Based on this historical data, Aagaard says, the most recent swarm is unlikely to lead to a large, damaging earthquake. Several of the swarms have lasted about 30 to 40 days, so East Bay residents likely will continue to experience light shaking for a couple more weeks. DOES A SWARM RELIEVE PRESSURE TO AVOID A BIGGER QUAKE? These small earthquakes relieve only a very tiny amount of stress compared with a magnitude-6.0 or larger earthquake. As a result, they do not reduce the occurrence of larger earthquakes. HOW LIKELY IS A LARGE EARTHQUAKE ON THE CALAVERAS FAULT? The probability of a magnitude-6.7 or larger quake on the northern section of the Calaveras fault in the next 30 years is 8 percent. The probability of a magnitude-6.7 or larger earthquake somewhere in the San Francisco Bay Area region in the next 30 years is 72 percent. WHAT SHOULD PEOPLE DO TO PREPARE FOR A BIG EARTHQUAKE? Experts suggest keeping a gallon of water per person per day for at least three days, for drinking and sanitation. They also recommend having a three-day supply of nonperishable food. Officials say people should have an earthquake preparedness kit with a flashlight, extra batteries, a battery-powered or hand crank radio and a National Oceanic and Atmospheric Administration radio with tone alert. Other items to have include a first-aid kit, a whistle to signal for help, a dust mask to help filter contaminated air, as well as plastic sheeting and duct tape to shelter in place. Maps, a can opener, a wrench or pliers to turn off utilities, as well as moist towels and garbage bags for personal sanitation are also advisable. 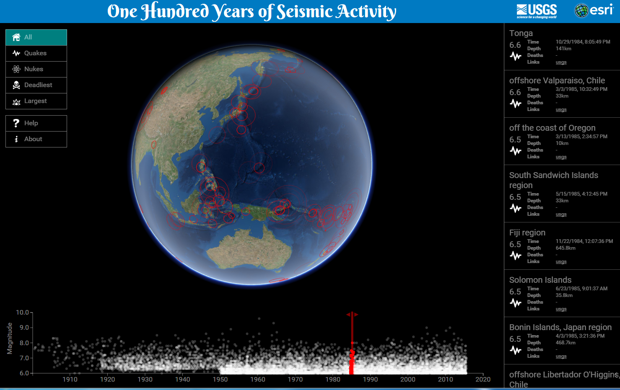 Richie Carmichael, a software developer at Esri, a company that provides geographic information system (GIS) software, has created a visualization of all that seismic activity: an interactive 3-D globe. Using data from USGS and Wikipedia, Carmichael plotted where and how large earthquakes were in any given year between 1900 and 2015. Users can rotate the virtual globe to see a specific area, and filter the data by the largest or deadliest earthquakes, as well as by the cause of the quakes—like those brought on by nuclear activity. In the chart below the globe, the clustering of dots—each dot representing one event—seems to suggest that earthquakes are becoming more frequent. Indeed, a recent study by USGS researchers found that there were more than twice as many “large” earthquakes (defined here as magnitudes 7 or above) in the first quarter of 2014 than there were back in 1979. The planet saw a record number of earthquakes last April, with 13 quakes with magnitudes of 6.5. “We have recently experienced a period that has had one of the highest rates of great earthquakes ever recorded,” according to Tom Parsons, a research geophysicist at USGS. But this doesn’t mean “The Big One” is coming. Most researchers agree that the frequency spike is most likely random. Plus, this isn’t the first time we’ve seen an uptick in quakes: between 1950 and 1965, the earth shook more than usual, too. As the USGS explains, “A temporary increase or decrease in seismicity is part of the normal fluctuation of earthquake rates. Neither an increase or decrease worldwide is a positive indication that a large earthquake is imminent.” In fact, Parson’s study shows that since 1979, the average rate of major earthquakes has been roughly 10 a year. What has increased, however, is the quality of surveillance. The USGS has more than 2,000 seismic sensors—many of which are in the U.S—and the agency plans to eventually establish a network of more than 7,000 sensors in the U.S. alone. That will allow for denser coverage in at-risk urban areas. To better track quakes outside of the U.S. border, the agency has tapped into the power of Twitter, monitoring tweets to detect quakes in as little as 29 seconds after an event. As detection has become more advanced, so has earthquake-resistant technology. Recently, a San Francisco hospital became the first U.S. building to use a thick goo that can absorb 80 to 90 percent of an earthquake’s energy. And in India, civil engineers are testing the use of old crushed tires to strengthen the base of buildings to reduce vibration. Their test has shown that when the rubber is mixed with sand, it’s possible to improve seismic resistance by as much as 50 percent. GPS measurements reveal that the crust beneath the Greenland ice sheet is already rebounding in response to rapid melting, providing the potential—according to researchers—for future earthquakes, as faults beneath the ice are relieved of their confining load. The possibility exists that these could trigger submarine landslides spawning tsunamis capable of threatening North Atlantic coastlines. Eastern Iceland is bouncing back too as its Vatnajökull ice cap fades away. When and if it vanishes entirely, new research predicts a lively response from the volcanoes currently residing beneath. A dramatic elevation in landslide activity would be inevitable in the Andes, Himalayas, European Alps and elsewhere, as the ice and permafrost that sustains many mountain faces melts and thaws. “The bottom line is that through our climate-changing activities we are loading the dice in favour of escalating geological havoc at a time when we can most do without it,” he concludes. We best speed up those tests on infrastructure that can resist quake damage—especially in cities. Update 16:19 UTC : As the earthquake happened in a rocky area, we do not think that severe damage would be registered. Slight damage is certainly a possibility. A large M6.7 earthquake has struck the West Pacific in the Soloman Islands East of Papua New Guinea. This events marks the THIRD large earthquake to strike the Soloman Islands this week. The Soloman Islands were specifically forecast to see large earthquake activity this week (after several weeks of relative silence). The earthquake forecast for the Soloman Islands was issued on August 8, 2015 — issued for a 7 day time period to watch the region. In addition to seeing the large earthquake activity in the Soloman islands, the other area which was warned in the earthquake forecast (South Japan) is now under alert / evacuations due to thousands of earthquakes near Sakurajima Volcano, with an impending very large eruption now possible. Update : we have still no news of the direct epicenter area. The location of the 2 killed people is about 40 km from the epicenter. ER would have considered that a radius of 30 km would have been dangerous for injuries and damage. Sad to hear that people lost their lives during this earthquake. The great Lakes area is an area with regular earthquakes. These earthquakes are generated by the irregular shape of the main fault who runs through the middle of the lakes. This major fault will be the reason that the eastern part of Africa will be split off from the western part in a couple of million years from now. In the meantime, the earthquakes will continue. Most of the bigger ones are happening in the middle of the lake and trigger a weakened shaking. Update : we are very sad to report that 3 people have been killed and at least 30 others injured by this earthquake. Update : 2882 houses collapsed and 8630 damaged in an intermediate report.